Neil Faulkner ARMSA (b.1962) was born in Staffordshire, England. Neil’s artistic ability was evident from a young age and after studying at Burslem School of Art he completed his diploma at Stoke Art College and from there followed a 40 year career with Wedgewood and then Royal Doulton creating designs and paintings for their porcelain. He was responsible for numerous commemorative projects including the Silver and Golden Jubilees of the Queen, the weddings of Charles and Lady Diana, Andrew and Sarah, for many of the royal births and the giftware commemorating the 80th, 90th and 100th birthdays of HRH Elizabeth the Queen Mother. Now working as a full time artist, Neil Faulkner paints in both oil and watercolour. His subject matter is varied and includes British and European landscapes, still life and maritime. He is concerned with the essential points of composition particularly colour, texture and observation and is fascinated with how light falls on objects especially grass, trees and through windows and doors. His skillful use of watercolour and eye for a composition result in beautiful, well observed paintings full of light and colour. As a young man Neil Faulkner was especially inspired by the work of American realist Andrew Wyeth after seeing an exhibition at the Royal Academy. Other influences include John Singer Sarjeant, Stanley Spencer and Sir William Russell Flint. 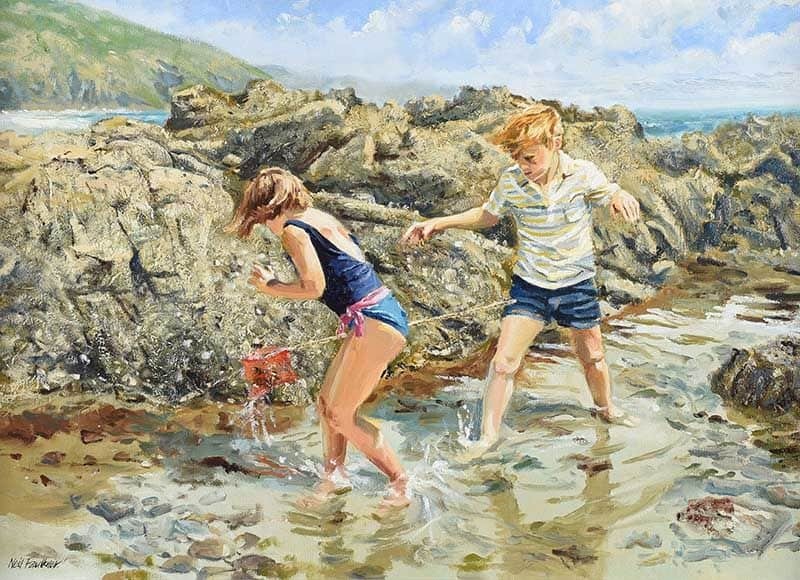 Neil Faulkner is an Associate member of the Royal Society of Marine Artists and a member of The Society of Staffordshire Artists. He has exhibited with the RI and the RSMA regularly at the Mall Galleries since 2010.